Rabah Kino from Special Olympics Lebanon is a multisport athlete who knows a few things about finding joy and success through sports. He’s an athlete who excels at both summer sports, including roller skating, and winter sports (alpine skiing is his specialty). While training for the 2013 World Winter Games, Rabah fell hard—and was badly injured. Doctors told him that he’d never ski again. This was tragic news, because skiing was Rabah’s life. Skiing was also one way he’d been able to demonstrate his talents and gifts to everyone, especially those who doubted the abilities of and coordination of an athlete with Down syndrome. 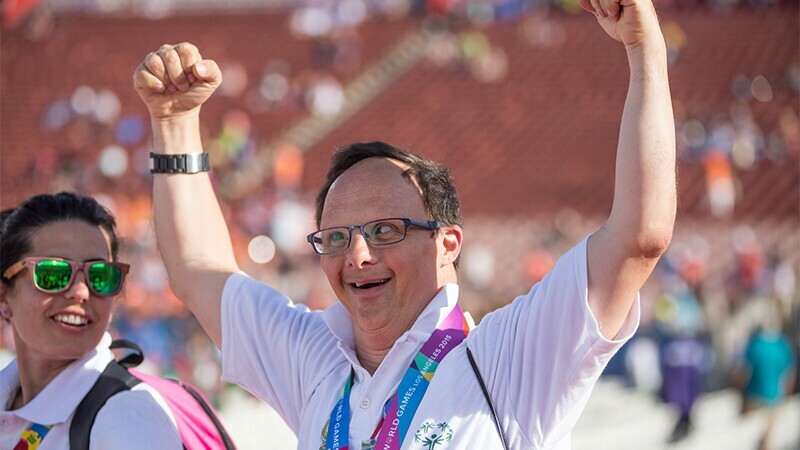 Special Olympics coaches and volunteers and his supportive family helped Rabah find new hope with a new sport. They encouraged him to start taking up swimming. Soon, he started getting good and quickly Rabah was tapped for Lebanon’s swim team at the 2015 World Games in Los Angeles. Rabah hasn’t stopped. In early 2018, he competed with other talented swimmers from all across the Middle East and North Africa at the 2018 IX Special Olympics MENA Regional Games in Abu Dhabi. Now in his 40s, Rabah has opened in a new chapter in his sports career: competing in open water swimming. But first, Rabah is training for gold in swimming at the upcoming 2019 World Games in Abu Dhabi. Rabah: "Every Day Is a Feast"